Busy week and went a little crazy over deadlines. Cleared up a lot of stuff. Caught up with a little reading in between. Cleaned up bookshelves. Drowned in nostalgia. Did some catching up with the past. Had bouts of tears. Family phone calls. Took Vidur for a haircut. Got caught in the rain. Made gaajar halwa. You would have loved it this time because I ground it – with respect for the braces! 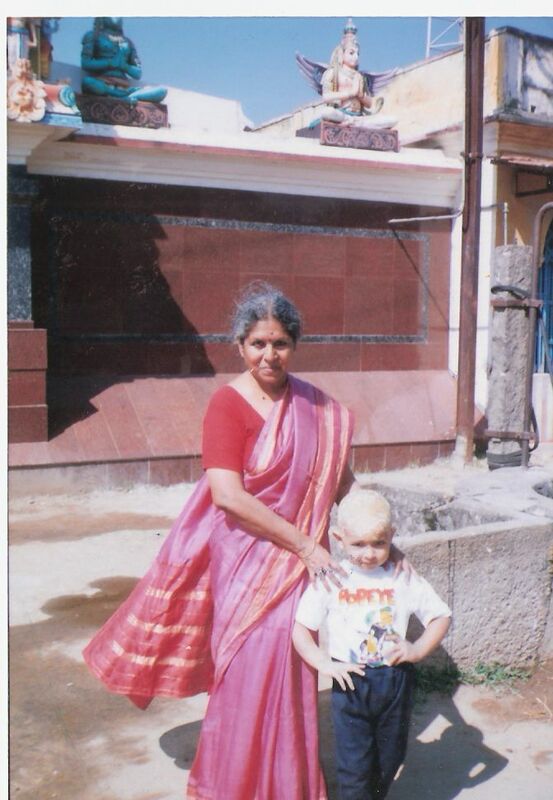 Here’s Vidur and you, in front of the Perumal Temple Varagur, Thanjavur – his very first haircut! Made major system changes in workfront. Scheduled blog posts. Made action plan for July. Had a six hour power-cut in two major parts and then mini-powercuts. Packed in a bundh on Monday, July 5. Supported two childrens’ education for one year. Strange thing – bought Nandini peda the other day and the peda dubba had pure khoa in it! Naturally the fellas wouldn’t understand and kept insisting it was peda. Funny chaps. They were tuned to hearing a complaint. Anyway got it right back home, and that explains the gaajar halwa, in response to Vidur’s – why can’t we make gaajar halwa from the orange carrot. Well, we can. 🙂 and we did. Been having a really nostalgic time clearing up Vidur’s bookshelves and kept thinking how much you would enjoy getting lost in the memories of how we got some of the books, and the ones Vidur especially enjoyed in the last few years, ever since he began to read. Just before I wound up, I switched on the TV for the heck of it – to realize it was already 2 pm and rushed to have lunch before going off to pick Vidur up – and I had a really eerie kind of feeling when the song for ‘athipookkal’ started up. I swear I heard you ask me if I was getting ready to leave. Ooh. Really freaky – as if you were sitting in that chair! Was chatting with Ms Valambi today – met her on the stairs on the way back from school. She was visiting her sister in law at the hospital when you were there. Sister in law is fine now. LIC mama called to invite us for his grandsons’ poonal. It is on July 9. Probably periamma and others will visit, I think. Sigh. Feeling a little out of sorts. Not surprising. Which reminds me…must call Uma and check on her. She went for a medical last week and I went and met her. The next day she had to go see her mom in Vellore..guessing she’s back by now. Will cal tomorrow and find out. She remembered you so much on her birthday. Well, I got her a sari :-D. As usual, we’ve got big plans for various outings, which barely materialize. Its tough enough to get time to sit and chat. As she was saying – thank God there’s a phone, and that she lives close to Vidur’s school! Making it easy to visit, of course. By the way, that Sophie Kinsella novel is not about the Shopaholic series. I was feeling guilty that I didn’t read it out to you. Sigh. Now feel slightly absolved. Did I tell you Sury is systematically reading all your Rajesh Kumars and others? I think he even plans to get some more. Geetha Venkatesh posted her class photo on Facebook today – and it was so thrilling to see Mrs Gardiner in the pic. 🙂 School… great times. I’ve been looking through your books in the glass cupboard. What a lot of notes! And what a lot of thoughts scribbled everywhere!. Now I know where I get the information-overload tendency from ! 🙂 But seriously some of it made such hilarious reading. Imagine – all those years ago we actually had the patience to write everything down! Now the papers are yellowing, but our memories remain green!